When I asked my friends how they potty trained their kids, more than one responded that her child wanted to be like their older underpants-wearing friends. Peer pressure seems to hold some sway with young kids. While underpants may motivate the fashionable, how can parents with fashion-indifferent kids make the move out of diapers more alluring? Wendy Wax and her sister Naomi Wax offer an ingenious lift-a-flap book that makes kids proud to potty. Even Firefighters Go To The Potty observes that all kinds of people answer Nature's call. Through Stephen Gilpin's colorful and funny illustrations readers wonder where important figures (a police officer, a doctor, a baseball player, a *gasp* waiter, a train engineer, and an astronaut- among others) have gone. The child can lift a door shaped flap on the page to reveal the missing cool person in the bathroom. The modest pictures keep everything G-rated while still showing urinals and other non-household bathroom features. The book made me laugh pretty hard. Just as I was acclimating to the rhythm "But an astronaut is missing. Where could he have gone? [life flap] To the potty. Even astronauts go to the potty," I found myself squirming to read "It's a busy day at the restaurant. The Sutton family is ready to order. But where did the waiter go?" Noooo! Waiters never go to the potty during their shifts. No! No! No! When Ranger lifted the flap to show a picture of a handsome fellow thoroughly washing his hands, I laughed with delight (and no small measure of relief). Ranger always laughs especially hard at the page because of my initial reaction. The book is charming and well-drawn and received far more interest than the classic Everyone Poops. Because it's a household comedy hit, I've had the slightly awkward pleasure of reading it to at least one visiting child. The preschool kids all proudly declared that they too go to the potty. I think that kind of enthusiasm would inspire early potter trainers to desire membership in the secret society of the commode. The book's pages are made of a heavily laminated cardstock. They're really durable. We let the Raptor (15 months) brutally drag the book all over the house and it shows no notable wear after weeks of unchecked abuse. For $8, this hardcover book is a steal. I wish we had owned it years ago. Wendy reports that Even Ballerinas Go To The Potty is currently being developed. I'd like to note that preschool girls and boys seem equally delighted by Even Firefighters Go To The Potty when we've read it with them. Parents who think about books and writers thinking about children's books will like Wendy's new blog. Learn more about her other titles at her website. ***Baby Toolkit is the from the trenches communique of two geek parents in the Midwestern United States. 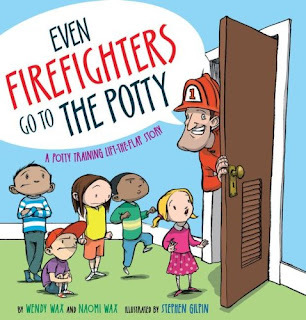 Wendy Wax sent us a free copy of Even Firefighters Go To The Potty ($8). We have no financial relationship with the book's authors or publishers. We are Amazon affiliates, so a small percentage of purchases made through our Amazon links help pay for our domain name and DSL service. Thanks for reading Baby Toolkit! Oh yah, we've checked this one out of the Newburgh library like twenty times. Definitely a favorite at our house, too! I don't know that it helped potty training much, but it was fun to read. I like how the pages are kind of laminated feeling so goop wipes off easily. We've got a lot of goop around here!